Sample Crush Tester for ECT, PAT, CCT, CLT, RCT, testing, Mullen burst testers, Puncture Testers, and many other testing devices for paper, board, and packaging. BXMKR – The Best Machines For Short Boxmaking! 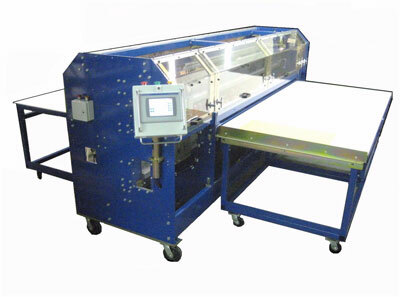 This model is designated as a single pass, all-in-one box making system. Stock sheets are fed into the machine where they are cut to the specified length and width, as well as slotted and scored according to the specified design. Even the glue tabs are trimmed per the depth specified. Up to 275 boxes per hour, depending on size and style, can be produced 24/7. Set up time for any given box is typically less than two minutes and is accomplished via a color touchscreen that is both informative and instructive. Enter up to 300 different orders in the production schedule. Store up to 2000 previously made boxes. Easy ‘search term’ feature enables finding jobs in just a few seconds. Most common box styles pre-programmed and by using the ‘Designer’ program you can make over 170 different FEFCO box styles. Contact us for a free cost analysis!